London Theatre Gift Vouchers are exchangeable for any current West End show available through Encore Tickets - see the participating show section for more details. London Theatre Gift Vouchers are available in denominations of £10, £20 and £50, and can be used for either full or part payment. Open Mon-Fri 9.30am-6.00pm, Sat 10.00am-5.00pm. Please note that we are open every day except Christmas day. If vouchers are redeemed over the phone, they must then be sent by post to one of our retails outlets for confirmation. All orders are dispatched on the next working day (Monday-Friday) by First Class post. Any orders taken over the weekend will be dispatched on the following Monday. If the tickets cost more than the value of your London Theatre Gift Vouchers, you can make the additional payment using cash, cheque or credit/debit card. Full price tickets are subject to a booking fee of up to 25% of the face value of the ticket. All tickets are subject to availability. 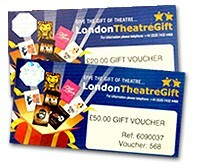 London Theatre Gift Vouchers are valid for redemption for one year from the date of issue.